Gertrude of Merania (1185 – 28 September 1213) was Queen of Hungary as the first wife of Andrew II from 1205 until her assassination. She was regent during her husband's absence. She is the main character in Ferenc Erkel's opera, Bánk bán. It is based on a true fact: Lord Bánk, a nobleman went touring the country on Gertrude's order, while the king was on crusade. His young wife stayed at home. Gertrude's brother fell in love with the young woman but she was afraid of him. Gertude encouraged her brother. When Lord Bánk heard of this, he was very angry and he was leader of the group of men that killed the queen. Her brother fled for his life. 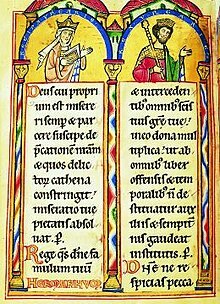 Wikimedia Commons has media related to Gertrude of Merania. ^ "Magyar Életrajzi Lexikon". Mek.niif.hu. Retrieved 2013-01-04.